The bright flowers in the foreground create a powerful framing effect. It may seem as though these garlands hang from a window frame and all that is missing is someone’s hand stretching out and pushing them aside to clear the view. This is another exotic motif, this time of a Japanese origin: if you examine these prints by Hiroshige Utagawa or Utamaro Kitagawa , you will notice strings of written text — Japanese hieroglyphs — adorning the prints’ sides. 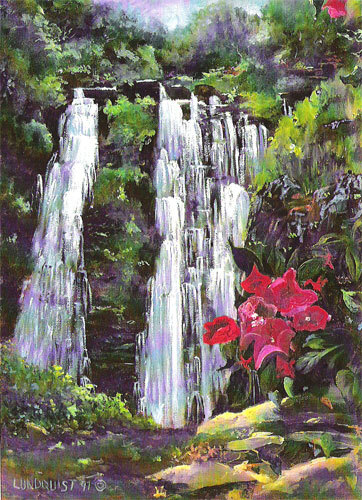 The hieroglyphs are often colored red, just like the color of the flowers on the sides of Dawn Lundquist’s waterfall paintings. This is a clever quote and an impressive trick that raises the value of the artwork by a link to another aesthetic heritage. It would be interesting to determine the symbolical meaning of the flowers (since they lack a textual one). I think that the meaning here is of broad allusion to civilization, as it was created by the written word; in this context the aim would be to remind the audience that civilization is near, that people are around, and that that hand may indeed appear as if from nowhere and clear the view for us. So in fact this is a soothing element — a somewhat paradoxical conclusion considering the alarming bright red color. On the other hand, we are being given a close-up view of the wild growth far ahead — a preparation and a warning — more signs of civilization. In terms of traditional western aesthetic the flowers may act as a focal point. However, the overpowering bright reds bend this role to claim more attention and importance. This feature creates a complex net of meanings, shuffling between foreground (and civilization) and background (and wild nature). The closed compositions add a sense of tropical atmospheric heaviness that makes itself notable after some viewing time — the time needed to desensitize oneself from the redness. Here the water, flowing in parallel to the garlands, refreshes the air, as if putting down a fire: the artist reminds us of the relief water brings by giving it a similar role in the painterly context. 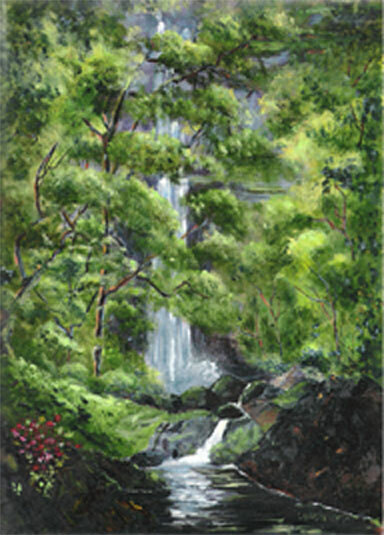 For my last review of Dawn Lundquist’s work I wanted to choose between the seascapes and the waterfalls. For various reasons, I prefer the latter works — admittedly a subjective bias. 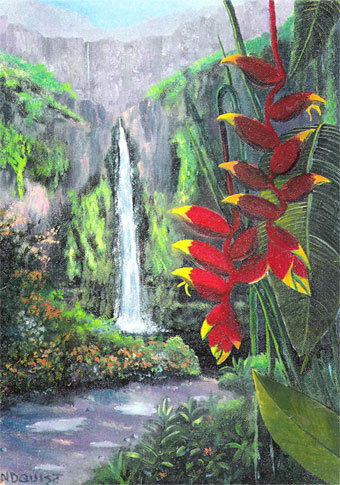 I love the richness of the vegetation and how the artist saturates the air with mist spray. I find the seascapes too familiar, living on the Mediterranean shore, whereas the Edenic waterfalls look fresh and tempting. But there is no doubt that the former possess similar freshness to appreciate which would take only a few hours inside an apartment, a cubicle, or a car — when the vacation is over. You are the best painter i have ever seen. you are awesome. Can you help me???? ?